We bopped down the highway from Petra to Wadi Rum, in a nice modern Hyundai, to the strains of modern Arab music. In the dusty main street we parked alongside a Toyota Landcruiser that was just the functioning side of being a wreck and our driver told us this was our host’s vehicle. Mehedi turned out to be a young, bearded Bedouin dressed all in flowing black. He helped us into his vehicle and we set off. Mehedi drove hunched over, with his nose scraping the steering wheel as he peered through the crazed cracks in the windshield. I was sitting in the front and got a particularly good view of his driving style because every time he accelerated my seat slid smoothly three feet backwards. When he braked I slid forwards back up next to him. Mercifully the trip to his headquarters was a short one. There we shared a cup of hot, sweet Bedouin tea and Mahedi explained our itinerary for the next day. Thankfully it involved transferring to an open-backed troop-carrier with fixed seats. Once our bags were slung in, we sat ourselves on the bench-seats, took a firm grip on the welded-metal surrounds and set off into the desert with Mehedi’s brother Aouda driving. First stop was Lawrence Springs. These are natural springs that seep forth at the top of a hill of tumbled boulders. We clambered up to the spring to be greeted with a sweeping view of the desert below. Huge expanses of flat plain, with hills suddenly rising vertically. I’m no geologist but the area looks exactly like an ancient sea-bed with the water taken away. Many of the hills have the slumped, melted look you get when you drip wet sand from your hand at the beach. We saw a number of things named after Lawrence of Arabia during our day. 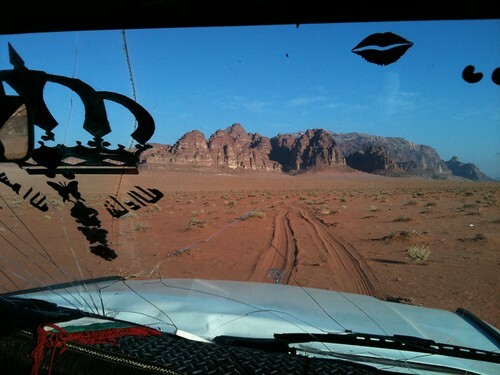 The reality is that their connection with Lawrence is tenuous at best; either they are connected with the movie, which was filmed in Wadi Rum, or they have been adopted for marketing reasons. I think we endeared ourselves to Aouda when we returned to ground level at the springs and asked what the Bedouin called the springs. He explained they were called “the eyes” because they made such a good lookout point. We drove on to see some ancient Nabatean rock carvings in walls that gave the best echos that any of us have ever heard. Driving about, bouncing on our bench seats revealed one stunning vista after another. Whenever we stopped the silence was extraordinary; broken only by an occasional cry from passing bird. We went to an enormous sand dune and broke the peaceful surroundings asunder by climbing up it and jumping back down while screaming. Certainly made up in fun what it lacked in tough, Bedouin hawk-eyed manliness. The red sand here is incredibly fine and dense, it resembles ground-cinnamon in colour and ground-paprika in consistency. It is very tough to climb but wonderful to fall into, and it doesn’t stick to you when you roll in it. 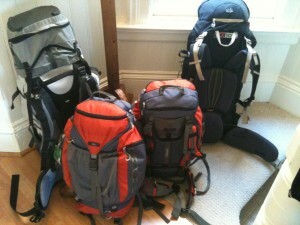 The tour was wonderful but we had two unscheduled elements which just made it for us. The first occurred as we were driving between some enormously eroded rocks and the dunes. In the middle of absolutely nowhere we came across a craggy, weather-beaten old man walking. Aouda stopped and they had a conversation in Arabic. It quickly became clear the old man’s vehicle had broken down. The two of them looked up at us, unsure of how we were going to react to this news and what to do next. Of course we said we should go and help, as they were clearly hoping we would. So we drove off with the old man sitting up beside us and shouting directions to Aouda in the cab. After churning our way through and over some dunes – a few of which took a couple of tries – we found the abandoned jeep. We then had our first view of Bedouin mechanics in action. No leaning over to have a look here. No, Aouda climbed up and into the engine. Squatting happily on the engine he shouted instructions to the old guy. After some ministrations with a piece of baling wire, some more shouting and a couple of bashes with the pliers, the jeep’s engine turned over and there were smiles all round. The old man climbed back into the jeep, waved out the window, and our last view of him was his jeep reversing off wildly to become a dot in the distance, the passenger door flapping wildly with each bump he hit. We drove off, in the forward direction, with Aouda putting on some speed to make up for lost time. That speed was responsible for our next unscheduled lesson in Bebouin car maintenance. Our next stop was supposed to be a natural rock arch; but the neighbourhood seemed fairly unexciting when next we stopped. Then Aouda pointed out that we had a flat tyre – a rock had gashed open the driver’s side front tyre and it was flat as a pancake. We all hopped out and Aouda asked us to help find flat rocks. Aouda’s cunning plan wasn’t immediately obvious, but gradually revealed itself. When Aouda was satisfied with our rocks he and I manhandled the spare tyre out of the truck-bed and positioned it in front of the flat tyre. Then Aouda got in the cab and drove up on to the spare tyre. The flat rocks were piled underneath the truck and then Aouda worked the spare tyre out from under the flat – leaving the truck ‘jacked’ up on the pile of rocks. After that it was the work of minutes to change the tyre and get off the rock jack simply by reversing. I guess this approach would only work in the desert when the sand makes it practical to work the spare out from under the flat, so it’s not something I’m planning on trying at home. 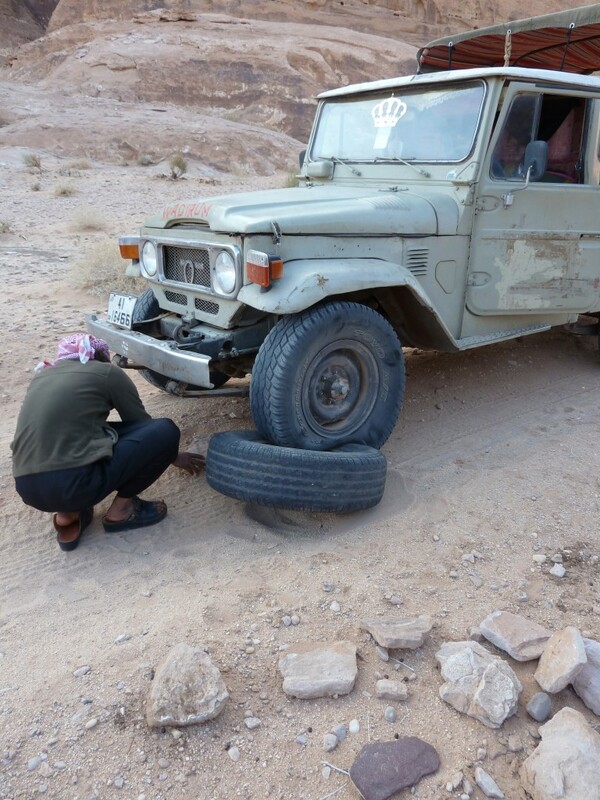 We saw some wonderful things on our day in the desert, but nothing half so entertaining as our Bedouin mechanic in action.